A couple of month's ago we were shopping and seen the new Nutro food that sparked ma's memory. 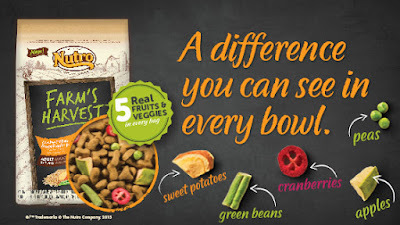 Our PetSmart had a display out with a small clear bowl of what the kibble looked like and it really looked like something that Jenny Sue, our spaniel would enjoy. After all, it had dried apples, cranberries, green beans, sweet potatoes and peas. All the things that Jenny Sue loves! Ma had talked with the Mars Petcare folks while we were attending Blogpaws. They had a display set up of the new food but we could never get close enough to talk about the Farm's Harvest foods. There were so many people and so little space. Ma handed them my card and said she would touch base after the conference. Ma remembered that I had received an email asking me if I had any questions that they could answer about any of the foods she had seen at Blogpaws. Ma replied and said she would like to know more about the food and if they would send her a sample bag to see if Jenny Sue would like it. They agreed and a few days later a bag of the Farm Harvest food along with the new Rotations food arrived. The Rotations formula is designed to help your pet transition between foods without any stomach upsets. We received the Lamb and Potato recipe. Jenny Sue loved it. 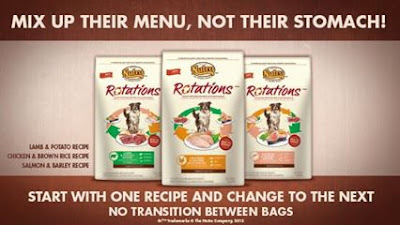 We started with the Rotations food to transition Jenny Sue from her previous kibble to the new food. There was no tummy upsets, no loose stools, and she loved the flavor. 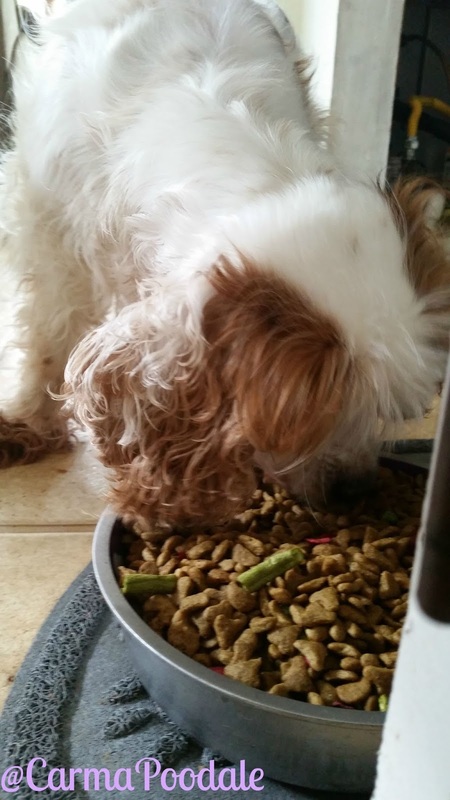 The kibble was a little larger than she normally ate but she was able to eat it with no problem. A week later ma decided to let her try the Farm's Harvest food. When ma opened the bag of the Farm's Harvest bag she was very happy to see the fresh fruits and veggies that were actually FRESH FRUITS AND VEGGIES! NON GMO! These weren't just pieces of kibble formed to look like fruits and veggies!! Ma decided to see just how these fruits and veggies looked when hydrated. She placed one of each in a bowl of water and went about checking her facebook feed, scratching bellies, petting the cat, you know...the important stuff. When she checked the bowl, she was super happy to see that it looked like she had put each piece of fruit and veggies in the bowl. She decided to do another test...the guinea pig test. Cinnamon wanted a treat so ma gave him one of the green beans out of the bag. He grabbed it and ran into his house only to return to wheek up a storm for some more. Ma handed him a cranberry. He gobbled it down and wanted more. Ma gave him a carrot to satisfy him. The veggies and fruits are freeze dried at the peak of freshness to keep all the vitimans and minerals in the fruits and veggies. 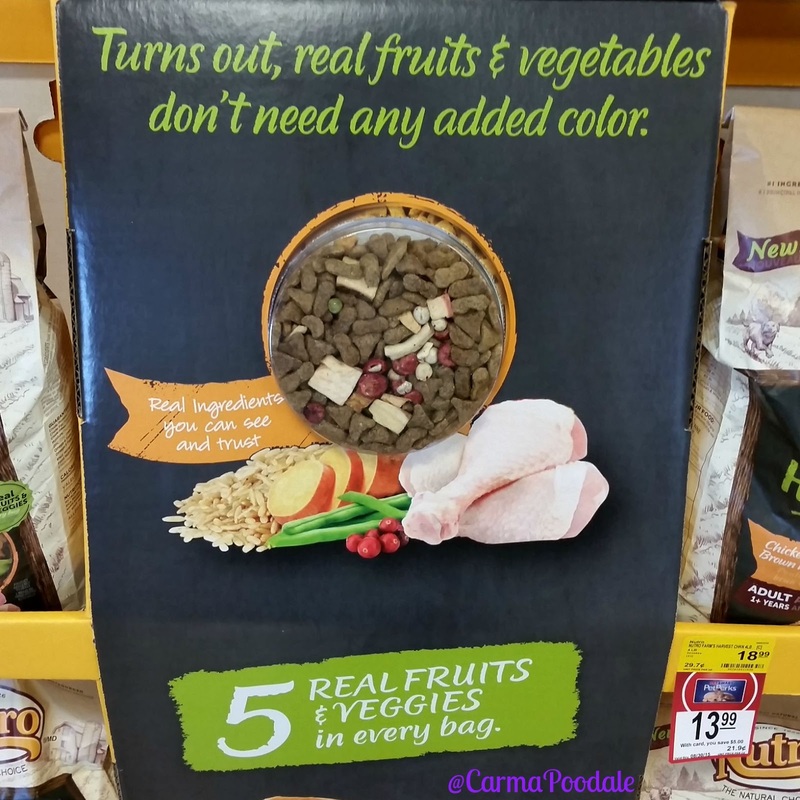 The colors that you see in the bag are the natural colors of the fruits and veggies. There are no artificial colors in this bag. The number one ingredient is meat. Our bag was made with the meat protein of Chicken. 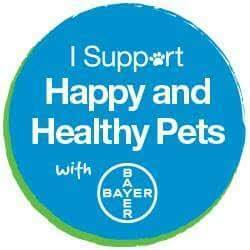 It also comes in lamb and salmon if you do not feed your pets chicken or if they have a intolerance to chicken. When talking to Nutro, we were told they do 600 quaility checks a day in their plants. Every manufacturing plant is located in the USA and they only use sources from verified suppliers. They want to make sure that what they promise is in the bag is there. We do not have any problems with grains and I love oatmeal and flaxseed. Ma handed Jenny Sue a green bean and Jenny Sue got to munching on it. 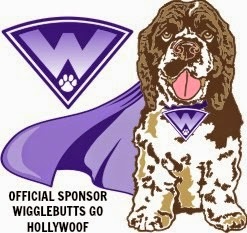 Ma say if they made green bean jerky that it would be the choice of our spaniel. Ma poured some in Jenny Sue's bowl.Jenny Sue is blind and deaf. Her nose works wonderfully. She started sniffing the air as soon as ma opened the bag and then she sniffed the food and started eating immediately. She didn't dig out all the fruits and veggies like ma thought she would but started eating the kibble first. I looked at ma and she had her mouth open in awe. She couldn't believe Jenny Sue was eating kibble. Ma thought that maybe Jenny Sue was just hungry and we would try the next day again with the food. Every day ma filled that bowl , that bowl was emptied by Jenny Sue. One day ma even caught me snacking on it. What can I say? It was delicious! You can see a little more about the cranberries here on this video that NUTRO™ has shared. We were sent a bag of the Rotations and a bag of the Farm's Harvest food in July. When Jenny Sue had finished the bags ma bought the previous food that she was on. That bag of food was donated to our humane society due to the fact that Jenny Sue refused to eat it. Ma went out the next day and bought another bag of Farm's Harvest food. Jenny Sue has since went through 2 more bags of Farm's Harvest. This is the only kibble that Jenny Sue will eat. 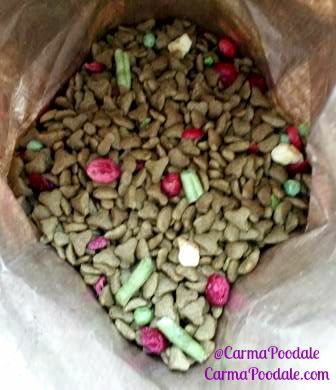 Jenny Sue gives this food a 4 paws up. All 4 go up after eating her food because she is doing a happy roll on the floor. I have to admit, seeing her happy with a food gets my *Poodale Approved* stamp of approval. 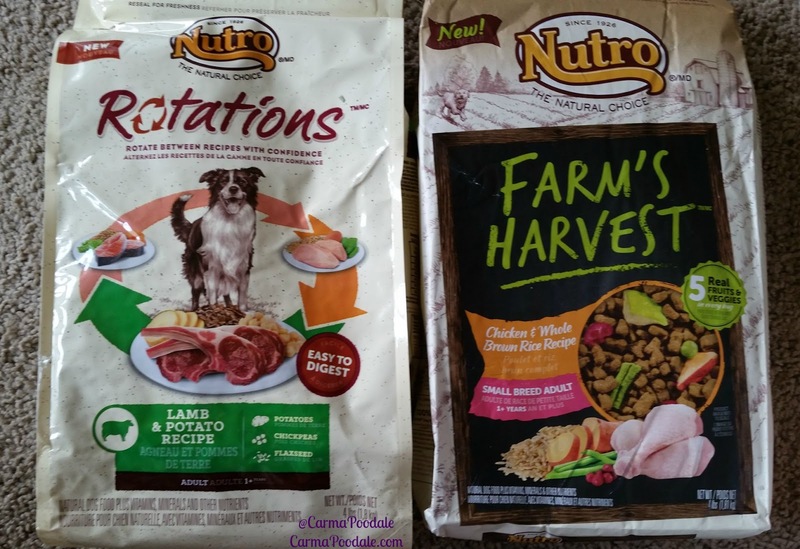 I don't give that stamp to many products but I honestly gave it to the Nutro Farm's Harvest and Rotation foods. 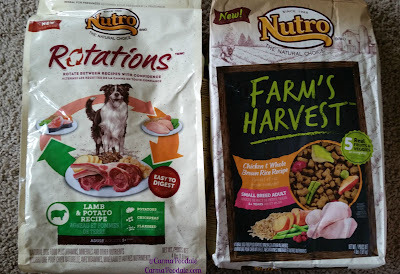 Well done, Nutro! Well done!!! 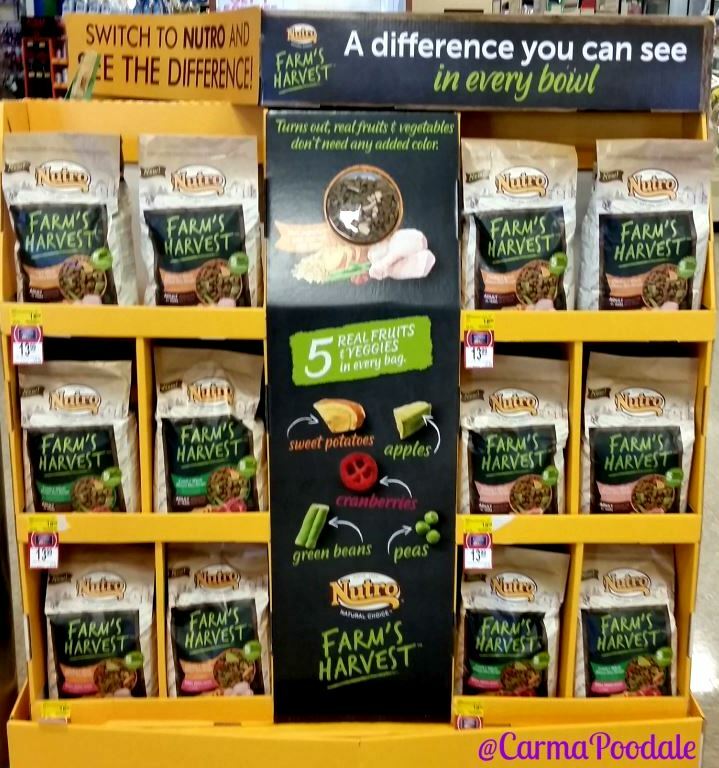 To learn more about FARM’S HARVEST™ and NUTRO™ ROTATIONS™ dog food and even more natural pet food products that pet parents can trust, visit www.nutro.com. Find us on Twitter and Facebook.